ImageDDS is a console tool for compressing/decompressing images into/from the Direct Draw Surface (DDS) container format. Converting images to the DDS format with or without compression. Converting images to the specified type. Converting images to the specified format. Compressing images using ZLIB and LZ4 compression algorithms. To invoke ImageDDS, run imagedds_x64 from the command prompt. Compression and decompression is performed according to conversion rules. There are compressed (PNG, JPEG) and uncompressed (PSD, TGA) generic image formats. The compressed generic formats can be either lossless (PNG) or lossy (JPEG) compression formats. Usually the source textures are stored in the PSD format, and then they can be exported to the intermediate formats such as TGA or PNG. If the high quality of the texture is important, it is better to use the PNG format instead of TGA. Such an image doesn't save the GPU memory just as TGA, but takes less disk space. The textures of the generic formats can be compressed to the formats supported by hardware. In this case, it is recommended to store all of the textures in the lossless compression format (such as PNG) to avoid an additional loss of the image quality after compression. Despite the fact that the formats supported by hardware are lossy compression formats, they are more preferable for real-time 3D applications, because the textures of such formats can be decompressed by the GPU on-the-fly. ATI1 R 2:1 compared to uncompressed R8 Compression is the same as the one used for alpha data in the DXT5 format. Supported by all graphics cards compatible with DirectX 11; additionally, all ATI graphics cards since X800. ATI2 RG 2:1 compared to uncompressed RG8 Compression for each channel is the same as the one used for alpha data in the DXT5 format. Supported by all graphics cards compatible with DirectX 11; additionally, all ATI graphics cards since X800. DXT1 RGB 6:1 compared to uncompressed RGB8 Uses 4x4 blocks for color interpolation and stores color values in 16 bits per pixel (R5:G6:B5). Can also store 1-bit alpha data; in this case, compresses images by a factor of 8:1 compared to RGBA8. This format is not recommended for storing normal maps. DXT3 RGBA 4:1 compared to uncompressed RGBA8 Stores RGB color values as the DXT1 format and uses four more bits for alpha data. Color values are interpreted as not having been pre-multiplied by alpha. Alpha values are not interpolated. Recommended for images with sharp alpha transitions. DXT5 RGBA 4:1 compared to uncompressed RGBA8 Stores RGB color values as the DXT1 format and uses four more bits for alpha data. Color values are interpreted as not having been pre-multiplied by alpha. Alpha values are interpolated. Recommended for images with smooth alpha transitions. If your texture needs rotation to fix orientation, invoke ImageDDS with the -r option. See also an example below. ZLIB lossless image compression allows for a smaller memory footprint for textures stored in the system memory (these formats are not supported by graphics cards). It is useful for images that cannot be compressed using quality-loss algorithms, for example, GUI textures with thin lines that need to be rendered with pixel precision. ZLIB compression is slower than LZ4 one, however, it provides higher compression ratio. ZLC1 RGBA Compressed format for images in the system memory. It is faster than ZLC2, however, it produces less compression: it uses Z_BEST_SPEED flag. ZLC2 RGBA Compressed format that provides a smaller file size, if compared to ZLC1 format. However, it is slower: it uses Z_BEST_COMPRESSION flag. Images compressed by using the ZLIB algorithm can be opened by the engine only. LZ4 lossless image compression algorithm provides high compression/decompression speed. It is faster than ZLIB compression, however, it provides lower compression ratio. LZ4 compression should be used if you often need to decompress images in run-time. LZ4 RGBA Compressed format that provides fast compression (for example, in run-time). Images compressed by using the LZ4 algorithm can be opened by the engine only. -o NAME — name of an output file. -p PREFIX — prefix to a name of the output file. -x POSTFIX — postfix to a name of the output file. -e EXT — output file format (.dds, .jpg, .tga, .png, .psd). 3d for a 3D texture. In order to be converted, the input texture should be a number of square layers of equal size that are glued together in a vertical column. Check the example below. cube_array for a cube texture array. -s SCALE — downscale an image using a given factor. The default is1.0, no image downscaling. -w WIDTH — resize an image proportionally to match a given width. -h HEIGHT — resize an image proportionally to match a given height. -z DEPTH — image depth. -ms SIZE — if the image is of the specified size or smaller, it will not be resized (a useful option for batch resizing of textures). 2D texture: values 1, 2, 3, 4 rotate the image clockwise by 90, 180, 270 and 360 degrees respectively. Values -1, -2, -3, -4 rotate the image counter-clockwise by the same degrees. 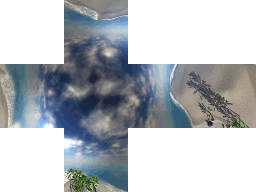 Cube texture: values 1, 2, 3 rotate the image clockwise; values -1, -2, -3 rotate the image counter-clockwise. Image rotation means swapping of axes and rotation of single faces to glue them seamlessly. 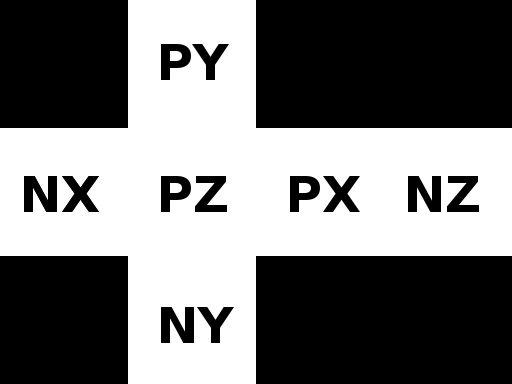 During clockwise rotation faces are swapped this way: p->pz, n->nz, py->px, ny->nx, pz->py, nz->ny. During counter-clockwise rotation faces are swapped this way: px->py, nx->ny, py->pz, ny->nz, pz->px, nz->nx. 3D texture: cannot be rotated. -b SIZE — blur the image with a given blurring factor. The default is0. -fx SIZE — flip image horizontally. -fy SIZE — flip image vertically. -i — print the information about the image. -n — create an empty image. -fp — use point filtration for mipmaps. -fl — use linear filtration for mipmaps (the default setting). -g GAMMA — make gamma corrected mipmaps. The default value is2.2. -c — compress an image into the DXT1, DXT5, ATI1 or ATI2 format. -d — decompress an image from DXT1, DXT3, DXT5, ATI1, ATI2, ZLC1, ZLC2, or LZ4 formats. -zlc1 — automatically compress an image into ZLC1 format. -zlc2 — automatically compress an image into ZLC2 format. -lz4 — automatically compress an image into LZ4 format. The script uses optimal settings for every texture type. Raw textures will not be compressed. It is recommended to create the uncompressed folder in data/my_project/textures to store uncompressed textures of the intermediate format (TGA, PNG). All of the textures should be stored in the uncompressed generic format (such as TGA) or lossless compression format (PNG) to avoid an additional loss of the image quality after compression. To compress all of your textures, run the imagedds_x64.py script from this folder. 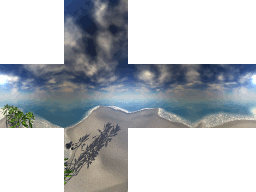 As a result, compressed textures with .dds extension are placed in the textures folder. Such way of storing textures allows fast texture re-export in case of any changes and also gives the ability to compress the same textures with the other options. -p PREFIX — prefix to names of the output files. -e EXT — output files format (DDS, JPG, TGA, PNG, PSD). -f FORMAT — convert to a given image format (see the details). -s SCALE — scale images using a given factor. The default is 1.0, no scaling. -c — compress images into a DXT1, DXT5, ATI1 or ATI2 format. -chdir DIRECTORY — change the current working directory. Diffuse, specular, albedo, metalness, shading, emission textures or light maps will be compressed into a DXT1, DXT5, ATI1 or ATI2 format and gamma corrected mipmaps (the default value is 2.2) will be created for them. Parallax, height, tessellation, ambient occlusion maps or microfiber textures will be compressed into ATI1 format and mipmaps will be created for them. Normal maps will be compressed into ATI2 format and mipmaps will be created for them. Mask textures will be compressed into a DXT1, DXT5, ATI1 or ATI2 format and mipmaps will be created for them. Diffuse, specular, albedo, metalness, emission, mask textures or light maps will be compressed into a DXT1, DXT5, ATI1 or ATI2 format and combined mipmaps will be created for them. Parallax, height, tessellation, ambient occlusion maps will be compressed into ATI1 format and combined mipmaps will be created for them. Normal maps will be compressed into ATI2 format and combined mipmaps will be created for them. For raw diffuse, specular, metalness, shading, emission textures or light maps gamma corrected mipmaps (the default value is 2.2) will be created. Raw albedo textures will be converted into RGB8 format and gamma corrected mipmaps (the default value is 2.2) will be created for them. Raw parallax, height, tessellation or ambient occlusion maps will be converted into R8 format and mipmaps will be created for them. Raw normal maps will be converted into RG8 format and mipmaps will be created for them. Raw normal rgb maps will be converted into RGB8 format and mipmaps will be created for them. For mask textures mipmaps will be created. You can specify the path to the input file relative to the binary ( file.tga) or as an absolute path (e.g. "D:\Unigine\data\my_project\file.tga"). Output files will have the same name as the originals, but with the .dds extension by default. This can be overridden with the -o or -e options.